Grandmother's Garden offers a beautiful park where the public is invited to appreciate the wonders of nature. 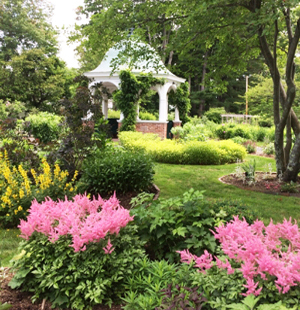 The Garden, situated just a few blocks from downtown Westfield MA, dates back to the 1920s, when a local businessman named Albert Steiger inherited a 10-acre plot of land from his father-in-law Chauncey Allen. In 1930, Albert gave the parcel of land bordered by Smith Ave., King Street and Grant Street to the city of Westfield to create a park. 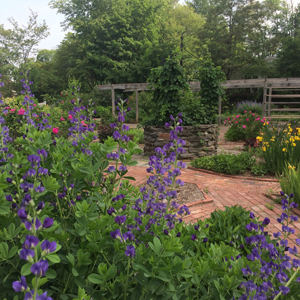 A formal flower garden was designed in a half acre section of the parcel as a memorial to Albert’s mother. That formal area became known as Grandmother’s Garden” and includes numerous ornamental flower beds, an herb garden, a central gazebo, wishing well and fountain. A lily pond, wading pool, and bandstand were constructed nearby in the park. For decades, the maintenance of the park that contains Grandmother’s Garden had been the responsibility of the city, with much of the work performed by volunteer members of the community. In 1994, during a period of decline and lack of resources, the city proposed to close the garden. A group of dedicated individuals formed a non-profit organization called Friends of Grandmother’s Garden (F.O.G.G.). 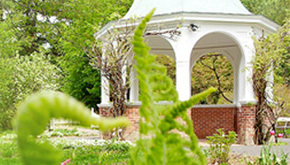 The group accepted responsibility for the preservation and maintenance of the Garden and Chauncey Allen Park, and was granted a 75 year lease by the City of Westfield. Spring and Summer 2015 - Pat Steele-Perkins (MG ’89) has been a member of the Friends of Grandmother’s Garden since it began in 1994, and serves on its Board of Directors. She volunteers much of her time and coordinates the maintenance of the garden. 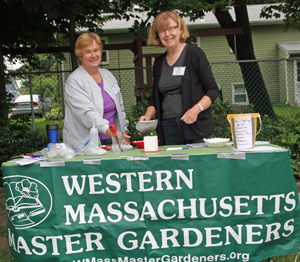 Pat has mentored many Western Mass Master Gardener interns over the years supervising their activities. Several Master Gardeners from the class of 2015 were involved with the maintenance of the garden throughout the 2015 season. On Saturdays, during the summer of 2015, soil-testing was offered to the public at the garden. We are looking forward to the next season, and would be very appreciative of any additional help with clean-up, pruning and weeding. We are almost always working at Grandmother’s Garden on Saturday mornings from 9:00 am to Noon and occasionally other days during the week.